So I’ve made some rather big life changes lately, which partially explains the lengthy delay between blog posts. My apologies! Rebecca and I have both had a lot of interesting things to write about but just not a whole lot of time. But rest assured, we’re back! If you happened to have read the “About Us” section, you may have noticed that up until recently I was working at Twitter in Chicago – and before that, Google. I absolutely loved working in the tech and digital media world for the last 5 years, but felt that in order to pursue some of the interests that I am passionate about, I needed to pivot and take a different road. Well, that road led me to New Orleans, LA and the MBA program at Tulane University. While it has been a rather significant change (and a slightly scary one after working and earning money) I can honestly say that after only a couple of weeks in my new world, it is shaping up to be one of the best decisions I’ve ever made. For those of you that equate New Orleans with fried food, Bourbon St. and Mardi Gras I’ll just say that (thanks to Rebecca, her friends and her family) I’ve learned that there is a lot more to love about this city and I am looking forward to experiencing everything it has to offer! So while I will now have final exams, group projects and be living off of a steady diet of Lucky Charms and Easy-Mac, the plus-side to this move was that I had a few weeks off between my last day of work and my first day of Tulane Orientation. And during that break I did what any young, single girl would do – I went on vacation with my parents and their friends in Northern Wisconsin. Now my parents’ friends aren’t just any ol’ group of adults. They. Are. Awesome. I might even argue that they are more awesome than my friends (sorry guys). During my time with them in the North Woods I witnessed the death of a beloved automobile at the hand’s of a (allegedly) mutant deer, I was cooked and baked any food that my little heart desired and I witnessed my mother form an unhealthy addiction to Mahjong. Unfortunately, as awesome as the group is, most of them are slightly lackingin their understanding of the latest and greatest technology. One still has a flip-phone circa 2001, one refuses to get on Facebook even though that means she misses countless pictures of her adorable grandchildren and even UTTER the words Twitter or Google+ and a collective explosion of brain cells occurs right before your eyes. That being said, I did find a way to introduce a small bit of new technology to them that helped make one aspect of their vacation a tiny bit easier – settling up expenses at the end of the trip. Surely most of you have been on a trip with a group of friends where you’ve either rented a house or a car together, shared food expenses or paid for something along the way that you intended to get reimbursed for. Therefore, most of us also know how ridiculously annoying it is to split expenses and pay people back as you go your separate ways at the end of the trip. Most people don’t carry much cash and I always seem to forget to bring a check to pay my share. Which means I have to wait until I get home to mail someone a check. Which means I have to find their address, an envelope AND a stamp. Which means they are unlikely to see that money until a good 30 days after the trip has ended. Luckily, some banks have finally gotten with the times and begun to embrace the idea of mobile banking on a variety of levels. One such service is called Chase QuickPay, and it’s an easy way to send money to a friend or family member without having to dig up your checkbook or ever step foot in an actual bank. If you don’t bank with Chase, don’t stop reading – this service doesn’t require both parties to have Chase so there are still some options that might work for you. Since there aren’t many restaurants in the North Woods, a lot of cooking tends to happen on this trip, and with that comes the issue of splitting up grocery costs. Traditionally my parents estimate the food/adult beverage costs for the week and have their friends give them a check upfront. If there is any money leftover at the end of the week, my Dad then reimburses each couple. This is a terrible process. It involves a) each couple writing a check to my Dad b) my Dad cashing each check c) my Dad then writing each couple ANOTHER check if there is any money leftover d) each couple then depositing THAT check. Lots of unnecessary steps. Lots of trees killed. 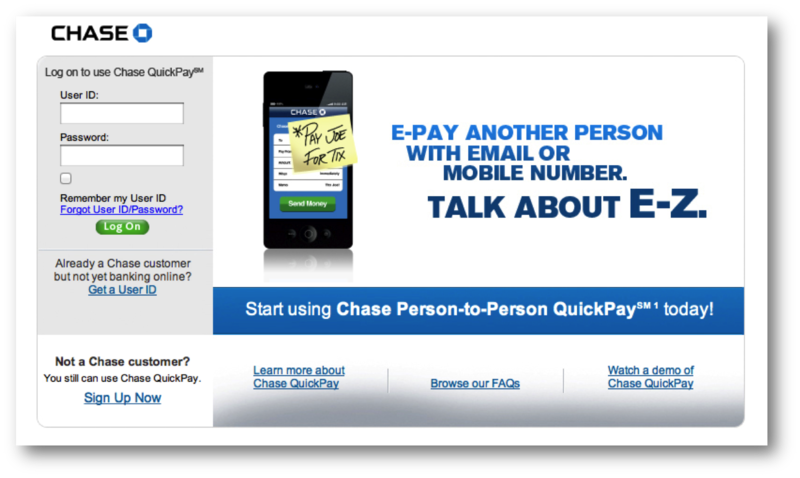 So here’s where Chase QuickPay comes in. My Dad uses Chase and also had the Chase Mobile app downloaded to his phone already, so I had him set up QuickPay within the mobile app. It also involved one verification step on his desktop computer but then he was good to go. As long as one person involved in the transaction is a Chase customer, the other person does not have to be. My Dad set up each person as a contact by entering their email addresses into the Chase app on his phone. 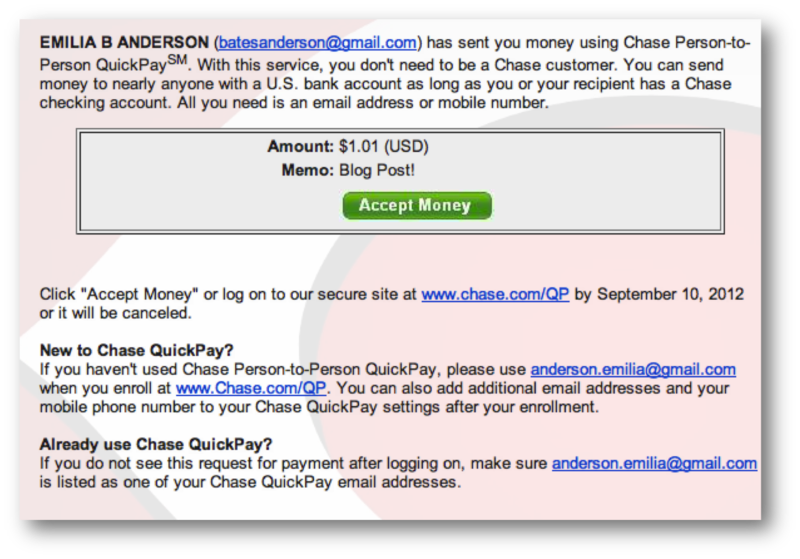 Non-Chase customer: Create a log-in using your email address (must match the one that the money was sent to). Then, similar to what PayPal does, you enter your bank information and verify that as well. The instructions are clear, and the whole process is not extremely time-consuming. This only needs to be done once. Once each party sets up their account and verifies all of their information, they will be able to accept or send payments. In this instance, my Dad could then receive money from each couple, or reimburse them any money that was leftover at the end of the week. While it does require a couple of set-up steps, the instructions walk you through the process, and all other person-to-person payment systems essentially work in much the same way. The person paying you or receiving money from you will never see your bank information, or vice versa, so it feels very secure. How long does it take to get your money, you ask? Is it instant? Does it take a week? Well, the bad news is, it is not instant – but the good news is, it only takes about 1-2 days at most and this whole process is generally still quicker than the process of sending/depositing checks. Similar to sending someone a check or depositing a check at the ATM, the funds have to “clear” which causes the bulk of the delay. There are also payment “cut-off” times that Chase specifies – but if you get the transaction in before the cut-off AND the payment is being sent to a Chase customer, it seems to take about 1 day. If it’s a payment to a non-Chase customer it can take an extra day in some instances. As with any new technology, there are customers that have seen bugs or some additional delays in receiving funds, and while doing some research online I did find a few people griping about the service. But my theory on this is that people tend to be more vocal when they’re upset or disappointed with something – as opposed to when they are satisfied. In general it seems to work very well, and in my personal experience I’ve never had any issues with sending or receiving money. Hopefully in the future these payments will become more “instant”, but for now it’s nice that this option exists and that it’s free. In summary, if you’ve ever split the cost of something with a group of people and you happen to be a Chase customer (or the person you owe money to or are due money from is), I’d recommend trying out this service. Chase seems to be at the forefront of mobile banking innovations (in another post we’ll talk about one of their other features, Chase Mobile Check Deposit) and I believe a couple of other banks are jumping on the bandwagon as well. If your bank doesn’t offer this right now, keep an eye out for it or something similar in the near future. Given that I feel absolutely no loyalty towards any particular bank, I tend to graviate towards tech-savvy banks that offer these kinds of options, so it’s worth exploring if you’re flexible. I like the direction that banks are going though – basically creating ways to assure I never have to actually VISIT the bank. Anything I can do on my smartphone these days saves me time, and I don’t know anyone who doesn’t like to have more time in their day. Hopefully as more people use the QuickPay Service, Chase will dedicate more resources towards making it faster and bug-free! Free – who likes paying for anything! Secure – no one likes identity theft! Don’t have to be a Chase customer (although at least one person involved in the transaction must be). All you need is email address and a valid U.S. Bank account (checking or savings account). Quickly send money to, or request money from friends and family members without having to remember your checkbook or cash. Takes about 10 min to set up QuickPay and then you never have to set anything up again.